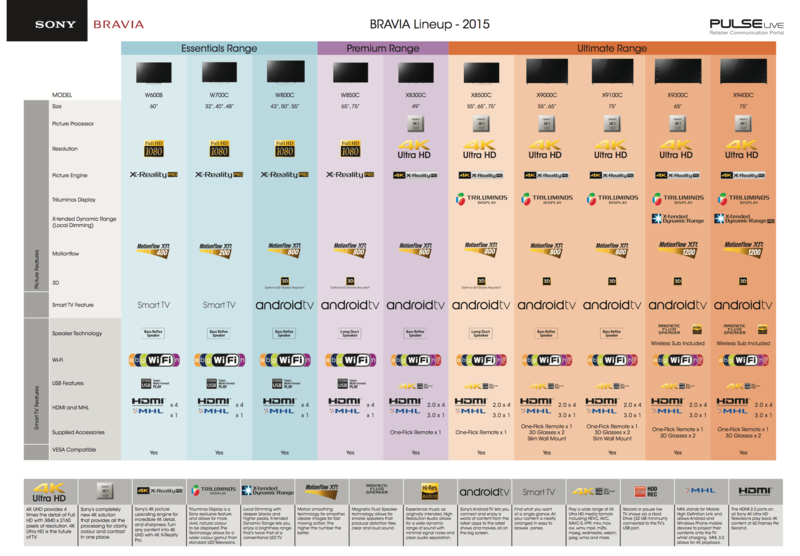 Sony has held media briefings in Sydney today to announce the arrival of their new Android powered TV lineup for 2015. We’ve known for a while that Sony was bringing these TVs to market, so it’s not a great big surprise, but it is nice to see them now (mostly) available for sale. With the exception of two lower-end devices, the range is powered by Android TV, and having had a hands on demo (and a bit of a play) I can confirm the experience is every bit as awesome as I expected it to be. For anyone familiar with Android TV on the Nexus Player or ADT-1, the experience is perfectly natural. As this is a TV, and not just a set-top box, there’s digital tuners built in, and these integrate very nicely with the Android TV motif; below the recommended section and featured apps, there’s a row of inputs that allow you to select free-to-air TV channels, one of 4 HDMI inputs, and one of two component inputs. Everything can be controlled by the included Sony remote, or you can drive it with a remote control app on your phone (Android or iOS) or even your smartwatch (Android Wear only). If you’re into your gaming, you’ll be pleased to know that the gaming aspect of Android TV is alive and kicking here. The Sony lineup supports PS4 (and PS3, if I’m not mistaken) controllers, as well as the Asus Gamepad sold alongside the Nexus Player. The gaming experience is pretty decent, but as we covered in our Nexus Player review, the range and quality of games available on Android TV can be a bit hit and miss. Still, the fact that you can pair and use these remotes just adds to the experience. It’s clear that Sony have put a bit of thought into how they’ll use the Android TV platform. The lower half of the range are a Full HD experience (1080p) powered by X-Reality Pro, a buzzword for basically pretty awesome picture quality. When you bump up to the 4K models, Sony has introduced their new X1 video processor, which not only upscales BluRay to fantastic (and very, very impressive) 4K, but your other content as well. You also enter the realm of Sony’s Triluminos display which represents amazing colours, the darkest of blacks and brightest of whites. There’s an awful lot of detail to digest across the range, but with pricing starting at just $1,399 for the W800C 43″, you can get into Android TV (with a fairly awesome new TV to boot) at a decent price. If 4K is your thing, pricing starts at $2,299 for the 49″ X8300C, all the way through to $11,999 for the 75″ monster shown above (and below). The Sony TV range includes both FullHD (1920×1080) and 4K UHD (3840 x 2160) resolution models. The 4K UHD TVs include 4x HDMI 2.0 connections, while the FullHD models still get 4x HDMI connections but get an older version of HDMI. The TV’s all include an MHL 3.0 connection for connection to smartphones, as well as support for multi-format video playback including: HEVC, AVC, XAVC-S,VP9, mkv, mov, avi, wmv, mp4. m2ts, mpeg, realmedia, webm, jpeg, wma and more. So the question is: How much and when? We’re arranging access to one of Sony’s smaller TVs (a 75″ review unit might be a bit hefty) so we can take a closer walk through it with you, and explain the features in more detail. It’s sufficient to say, though, that Sony has a reputation for making a good TV, and from what I saw this morning, these new Android TV powered models are nothing less than exceptional. Looking at getting the 50″, at the moment Harveys have the for just under $1500 with a bonus case of wine. I don’t drink wine but the missus will love it. This is all well and good, but when is Sony releasing the Z4 Tablet in Aus? This is the one and only thing I want from you Sony. It went on-sale in Singapore last weekend, that’s usually a sign that it’s close to launching here. We’re watching, you’ll see it here as soon as we know. Cheers. Thanks, I hope no-one at Ausdroid thought I was raging at them. You guys are awesome. I’m still clunking along with my HP Touchpad flashed with Cyanogen Mod. I’ve been waiting for this for 6 mths and I’m getting a little testy at times. Hi Edgar, are you running the app from Google Play or the Sony TV app? We haven’t got a review unit as yet, but we’ll certainly try when we do. Might also check in with Sony on that. I got the update last night, and I get the same experience. After entering the password it returns back to the welcome screen. Very frustrating. I was looking forwards to the new Sony lineup, but they blew it with their UHD models by limiting them to HDMI 1.x. I did indeed typo my comment. It’s the sort of thing that’s easy to happen when you’re monitoring 3 other things whilst making a comment here. Was doing a Windows Update install on my main notebook, Windows Update checking on my netbook, and dinner was in the oven cooking.